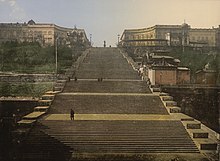 The Potemkin Stairs, or Potemkin Steps (Ukrainian: Потьомкінські сходи, Potj'omkins'ky Skhody, Russian: Потёмкинская лестница, Potyomkinskaya Lestnitsa), is a giant stairway in Odessa, Ukraine. The stairs are considered a formal entrance into the city from the direction of the sea and are the best known symbol of Odessa. The stairs were originally known as the Boulevard steps, the Giant Staircase, or the Richelieu steps. The top step is 12.5 meters (41 feet) wide, and the lowest step is 21.7 meters (70.8 feet) wide. The staircase extends for 142 meters, but it gives the illusion of greater length. The stairs were so precisely constructed as to create an optical illusion. A person looking down the stairs sees only the landings, and the steps are invisible, but a person looking up sees only steps, and the landings are invisible. Odessa, perched on a high steppe plateau, needed direct access to the harbor below it. Before the stairs were constructed, winding paths and crude wooden stairs were the only access to the harbor. The original 200 stairs were designed in 1825 by Italian architect Francesco Boffo and St. Petersburg architects Avraam I. Melnikov and Pot'e. The staircase cost 800,000 rubles to build. In 1837, the decision was made to build a "monstrous staircase", which was constructed between 1837 and 1841. An English engineer named John Upton supervised the construction. Upton had fled Britain while on bail for forgery. Upton went on to oversee the construction of the huge dry-docks constructed in Sevastopol and completed in 1853. Greenish-grey sandstone from the Austrian port of Trieste (now in Italy) was shipped in. As erosion destroyed the stairs, in 1933 the sandstone was replaced by rose-grey granite from the Boh area, and the landings were covered with asphalt. Eight steps were lost under the sand when the port was being extended, reducing the number of stairs to 192, with ten landings. The steps were made famous in Sergei Eisenstein's 1925 silent film Battleship Potemkin. On the left side of the stairs, a funicular railway was built in 1906 to transport people up and down instead of walking. After 73 years of operation (with breaks caused by revolution and war), the funicular was replaced by an escalator in 1970. The escalator was in turn closed in 1997 but a new funicular was opened on 2 September 2005. After the Soviet revolution, in 1955, the Primorsky Stairs were renamed as Potemkin Stairs to honor the 50th anniversary of the mutiny on the Battleship Potemkin. After Ukrainian independence, like many streets in Odessa, the previous name – 'Primorsky Stairs' was reinstated to the stairs. Most Odessites still know and refer to the stairs by their Soviet name. At the top of the stairs is the Duke de Richelieu Monument, depicting Odessa's first Mayor. The Roman-toga figure was designed by the Russian sculptor, Ivan Petrovich Martos (1754–1835). The statue was cast in bronze by Yefimov and unveiled in 1826. It is the first monument erected in the city. Potemkin Stairs; the landings are invisible from the bottom. Potemkin Stairs; the steps are invisible from the top. ^ Herlihy, p. 140 "12.5 meters wide and 21.5 meters wide"
^ Kononova, p. 51 "12.5 m at the top and 21.6 m at the bottom"
^ Karakina, p. 31 "13.4 and 21.7 meters wide"
^ Kononova confusingly writes on page 48, "The idea of an architectural ensemble with a broad flight of stone steps leading to the sea which links the high bank with the low shore and provides a gateway to the city, belongs to the well-known St. Petersburg 19th century architect Avraam Melnikov", but on page 51 writes, "The famous Potemkin stairs leading from the square to the sea and Uiltsa Suvorova (Suvorov St.) was designed in 1825 by F. Boffo". ^ a b c "Primorsky (Potemkin) Stairs". 2odessa.com. Retrieved 2006-08-02. ^ "Duke de Richelieu Monument". 2odessa.com. Retrieved 2006-08-02. ^ Herlihy, p. 140, Quoting Koch, Charles (1855). The Crimea and Odessa: Journal of a tour. London. p. 260. ^ Herlihy, p. 140, Quoting Hommaire de Hell, Xavier (1847). Travels in the Steps of the Caspian Sea, the Crimea, the Caucasus, etc. London. p. 10. ^ Herlihy, p. 140, Quoting Jeese, William (1841). Notes of a Half-Pay in Search of Health: Russia, Circassia, and the Crimea, in 1839-1840. 2 vols. London. volume 1, p. 183. ^ Herlihy, p. 317, Quoting William Hamm, 1862, p. 95-96. ^ Herlihy, p. 317, paraphrasing Shirley Brooks, 185, p. 18. Wikimedia Commons has media related to Potemkin Stairs. Kononova, G. (1984). Odessa: A Guide. Moscow: Raduga Publishers. "Primorsky (Potemkin) Stairs". 2odessa.com. Retrieved 2006-07-30. This page was last edited on 5 March 2019, at 12:50 (UTC).